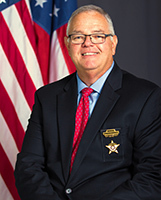 Court Services is responsible for fulfilling the Sheriff's constitutional responsibility to provide comprehensive law enforcement and security services to the courts of Newton County. Sheriff's Deputies and support staff maintain courtroom safety by protecting citizens, judges, jurors, and inmates during court proceedings. Court Services Deputies are also responsible for facility security of the Newton County Administration Building. The Court Services Division provides full law enforcement services to the courthouses and buildings.